PUERTO MORELOS, MEXICO, Dec 11 2015 (IPS) - When the habitants of Puerto Morelos saw their white beaches turn brown, they felt they needed to take urgent action for their community. Given the limited effectiveness of the response, they organized themselves to clean public beaches, but the situation got worse. The summer of 2015 will be remembered by chroniclers of Puerto Morelos, Quintana Roo, in the Mexican Mayan Riviera as one of the worst in the city’s climate history, affecting the shores as well as local economies and regional dependent coastal marine ecosystems. This summer, according to data released by the National Oceanic and Atmospheric Administration US (NOAA), we had the highest rates of temperature recorded in land and ocean surfaces on the planet in the last 135 years. And if that was not enough, tons of sargassum algae stormed the Caribbean coast, turning the shores brown and emitting a foul odor (hydrogen sulphide) due to the decomposition of the algae, causing the cancellation of hundreds of domestic and international flights and reservations at hotels, bringing loss of economic benefit and permanent and temporary jobs in the region. The Caribbean has always had sargassum in their coasts, this algae derives its name from Portuguese navigators since the clusters of algae is very similar to a type of grape that grows in Portugal called sargaço. The algae is found in the Atlantic Ocean region, on the north-Equatorial and east coast of Africa. At sea, this algae forms a valuable ecosystem, it supports ocean food webs, provides special shelter and fodder for juvenile turtles, commercially important species and young infants of different endangered species. And on the coasts, in moderate amounts, it provides power to shorebirds because it attracts insects, prevents erosion of beaches and fertilizes the plants in the coastal dune. This algae is transported by ocean currents through the Caribbean and into the Gulf of Mexico; it also arrives by currents coming from South America. Usually, the currents that reach the Caribbean Sea and the Gulf of Mexico are the same. But this year, according to University of Galveston (Texas) researchers, a change in ocean currents due to increased sea temperatures affected the distribution of sargassum sending tons of algae to the Caribbean coasts. Another hypothesis raised by Brian Lapointe, an expert in sargassum by the Florida Atlantic University in the US, is that pollution nutrients generated by human activities and industrial agriculture, are discharged into the sea by the Mississippi river, adding nutrients to the sea that are used by this macro-algae. Throughout the history of Quintana Roo, Puerto Morelos has been characterized by its coral reef as one of the world’s largest barrier, and is also known for being a banner of conservation and scientific research in the state of Quintana Roo. Population and authorities tried to clean the beaches but the situation continued to deteriorate since the tractor-collectors were a risk for the turtle nesting area. Authorities therefore banned tractors, and the community decided to take action on the matter. On August 4 of this year, a citizen forum entitled: ”Implementation of actions to enjoy clean beaches in Puerto Morelos” was led by Velázquez Olimán, hydrogeologist and director of the Center for Research and Innovation for Sustainable Development, Guadalupe. Six proposals offering a solution to the problem of managing sargassum were received and submitted during the event. This forum intended to implement mechanisms and actions that contribute to a comprehensive solution for managing sargassum on the beaches, promoting a different alternative to the one envisaged by the authorities (deposit sargassum in sascaberas). 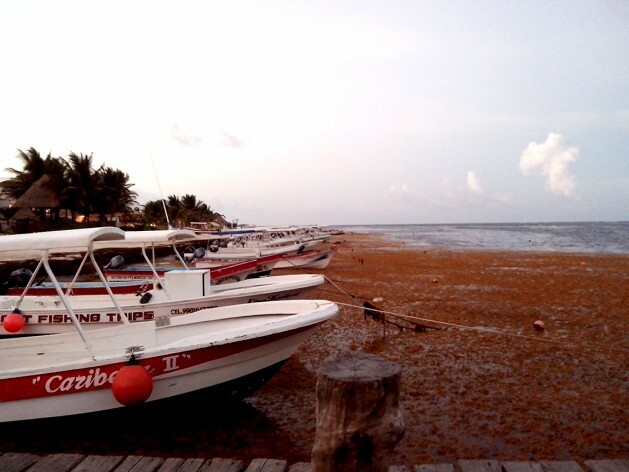 It is important to publicize, promote, invest and replicate innovative projects such as the “Implementation of actions to enjoy clean beaches in Puerto Morelos”, as this initiative could provide important employment and income opportunities in areas such as enlargement of the coastal protection as well of science and food security by transforming natural kelp fertilizer and agricultural food. Globally, the demand for services and sustainable activities is on the rise. With its people and scientists’ willingness, Puerto Morelos wants to be an example of climate adaptation. This story was sourced through the Voices2Paris UNDP storytelling contest on climate change and developed thanks to Catalina Arévalo from Agencia EFE.